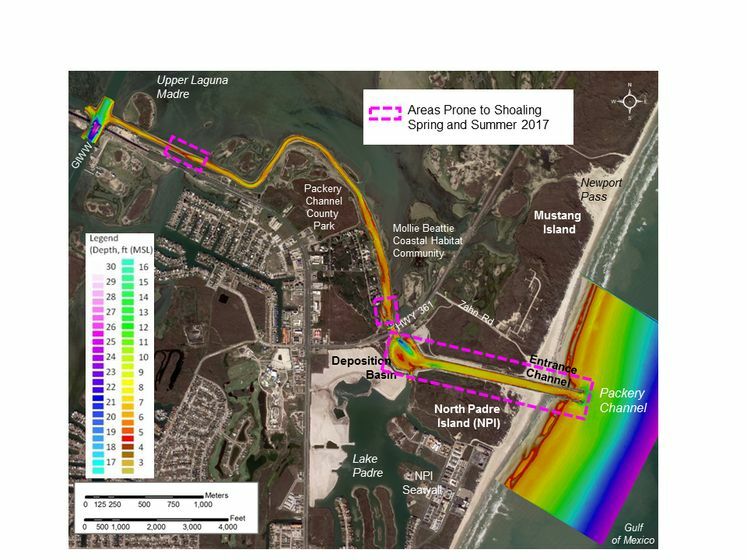 CORPUS CHRISTI, TX - The City of Corpus Christi advises boaters that continued shoaling has been measured at Packery Channel as part of the ongoing monitoring process conducted by the Conrad Blucher Institute (CBI) at Texas A&M University – Corpus Christi. Boaters should always exercise caution when navigating shallow draft channels such as Packery Channel. Those navigating the channel should use caution as increased sand accumulations (shoaling) have resulted in shallow conditions in some areas. Channels are dynamic natural systems in which sand is always migrating and therefore shoals can rapidly change in size, location and elevation. Where the channel was deeper one trip it may be shallower the next trip. Extra caution should be observed when navigating the entire channel from the Gulf Intracoastal Waterway (GIWW) to the Gulf and in particular in the Deposition Basin (boat ramp area) to the end of the Entrance Channel at the Gulf of Mexico (map attached). According to CBI, the unusual peak in shoaling that occurred during the winter months increased the potential for greater accumulation of sand (shoaling) in the Entrance Channel over the following spring and summer months. Spring and summer are the time of the year when the greatest shoaling has occurred in Packery Channel in the past. A local notice to mariners has been initiated by the City of Corpus Christi with the U.S. Coast Guard (USCG). In addition to this formal request reviewed by the USGC, the City of Corpus Christi is urging the public to exercise caution when navigating the entire channel until the scheduled dredge is conducted during the winter of 2018/2019. For more information contact Assistant City Manager Keith Selman at (361) 826-3232 or keithse@cctexas.com or TAMU-CC University Research Scientist Deidre Williams at (361) 825-2714 or at deidre.williams@tamucc.edu.